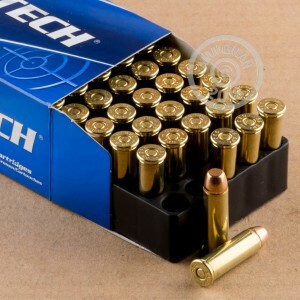 Choose this 38 Special handgun ammunition by trusted leader Magtech for your target practice and plinking needs! This 50 round box comes brand new and will give you the high performing results you deserve. Each round contains a 130 grain Full Metal Case bullet, ideal for indoor shooting facilities, as well as outdoors. The bullet exits the muzzle of the gun at a velocity of 800 feet per second. The cartridge is cased in factory brass and contains a Boxer type primer, which is perfect for reloading due to its ease of being removed and replaced. The non-corrosive primer will also leave the barrel of your firearm much cleaner, allowing you to shoot more between cleanings. 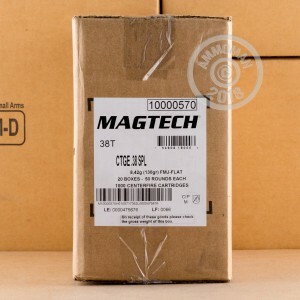 Magtech Ammunition's history dates back to 1825. They are a leader in the engineering, manufacturing, marketing and distribution of small arms ammunition products to more than 50 countries around the globe. 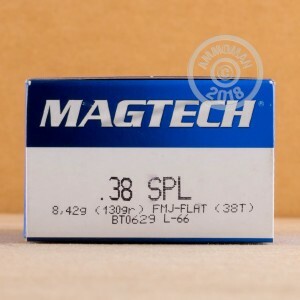 You can trust Magtech's 38 Special FMC to exceed your expectations.